All Scottish Fold cats can trace their ancestry back to the original Scottish Fold called Susie, who was found on a farm in 1961. She gave birth to two kittens that also had the characteristic folded ears. One of them was bred to then found the line of the existing breed. The characteristic folded ears are a result of a dominant gene. 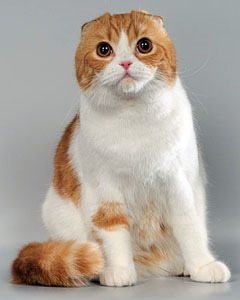 The Scottish Fold cat is also known as the Highland Fold, Scottish Fold Longhair and Coupari. Scottish Fold cats can give birth to both kittens with folded ears and with straight ears, forming two separate type, although the ones with straight ears cannot be considered Folds. The most obvious characteristic of the Scottish Fold Cat is the folded ears. All cats are born with straight ears, but those with fold in their dominant gene will start showing the fold in 21 days. The Scottish Fold cats are medium sized cats. Their bodies, heads, face as well as eyes are rounded. They have medium to short legs. They can be longhaired or shorthaired and can have many different colors and combination of colors. 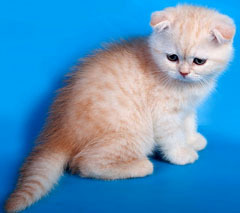 The Scottish Fold cats are sweet natured and placid and can easily adapt to people as well as other domestic animals. They are very affectionate, intelligent and playful as well as loyal. They are known for sleeping on their back, in what is dubbed as the ‘Buddha position’. The Scottish Fold cats do not need any specific grooming apart from regular brushing. However, it should be noted that they are prone to Polycystic Kidney Disease, Cardiomyopathy and Osteochondrodysplasia. my kitty just passed i wondr if they have these at pound????????……….!!!!! ;) please reply. keep in mind im 11!!!!!!!!!!!! Most cat breeds are prone to those same diseases… especially kidney disfunction. Don’t let that deter you from this breed. If you export please mail us. We have a 6 month old scottish fold kitten. He is so cute, and yes he follows us all over the house and likes to lean on our feet when we’re in the kitchen. He is so snoopy and wants to get into everything, including the garbage. He is an absolute doll to have. He also gets along very well our other 3 cats. We love him and his habbits. This is my first scottish fold and we love having a lap kitty again. Our other 3 dont sit on us much. My only concern is , he loves to bite, and I am having a problem getting him to stop. HELP!!!!! !